• Sculpture element: 52 oversized playing cards cut from sheetrock. 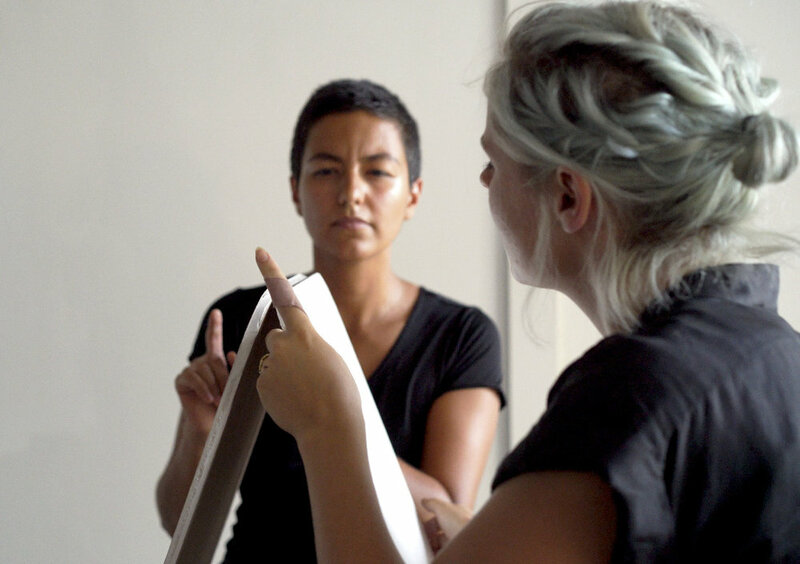 Fault Lines is a collaborative sculpture-based performance work by artists Jemila MacEwan and Nooshin Rostami. 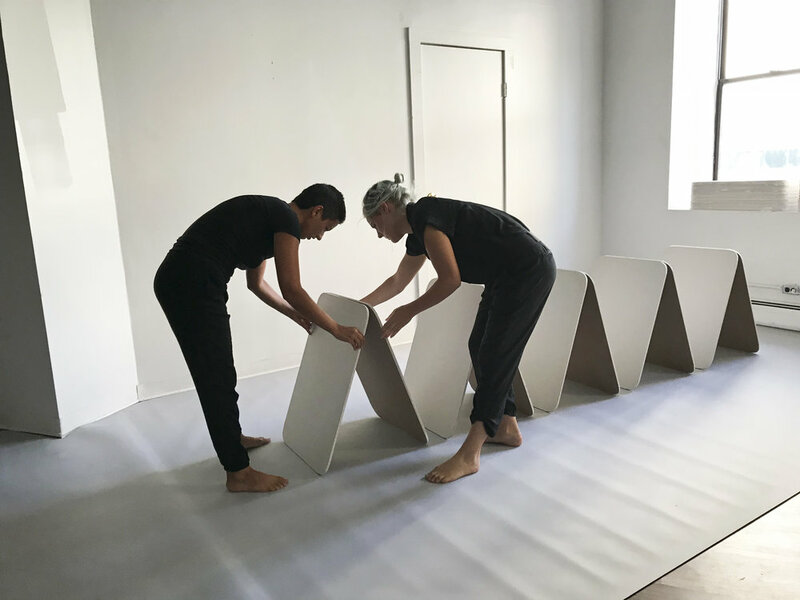 In this performance MacEwan and Rostami, construct a giant house of cards without the use of verbal communication. At various stages in the performance the artists invited members of the audience to assist them to build the structure. During the second half of the performance the artists withdrew various load bearing cards from the structure until the construction eventually gave way, crashing to the ground. This performance embodies the notion of the fault line as a point of tension between two entities and the implication of blame and liability (fault) in the instance of failure. The geological term ‘fault line’ is the meeting point between two tectonic plates, which creates a geographically unstable region subject to earthquakes and other natural disasters. The artists re-contextualize this term as the point of conflict between national and political borders on a global scale. As immigrant artists, MacEwan and Rostami consider the complexity of their own geographical histories and the politics in the negotiation of their own displacement. Fault Lines adopts a simple and familiar game of balance to explore the fragility of community as a vulnerable structure under pressure. The artists take a conceptual approach to the act of construction by creating a series of intensely felt moments of tension. 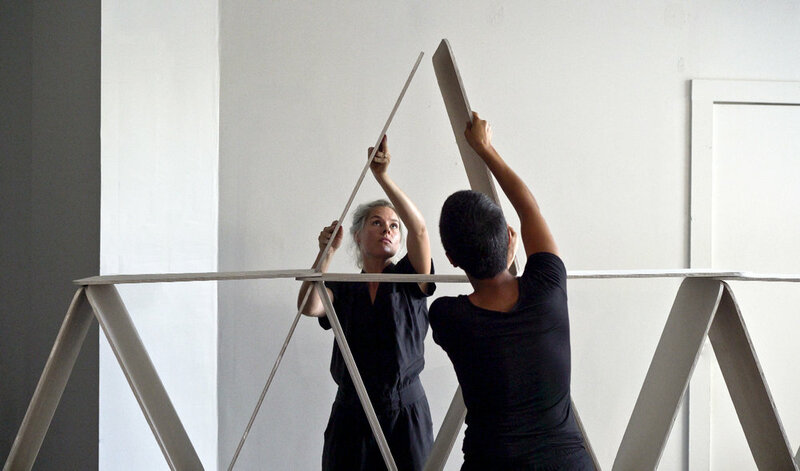 This performance re-imagines construction as an emotionally laborious collaborative process of constantly attempting to anticipate and mitigate failure.